Giving Tuesday is the day to do good stuff for charity! Straight after Black Friday and Cyber Monday, the aim of Giving Tuesday is to raise the most money for charity within 24 hours. We know that lots of families on RoosterMoney are passionate about supporting charities. That’s why we created the Give pot nearly 1 year ago! In celebration of that milestone we share 3 ways you and your children can get involved in this year’s Giving Tuesday! The Give pot was created as a place that children could set aside money for causes they’re passionate for. You can even set a split allowance rate to send a % of allowance towards the Give pot each allowance day! Making setting a little aside even easier. 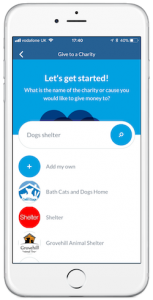 Earlier this year, we teamed up with JustGiving to integrate their database of thousands of charities with the Give Pot. 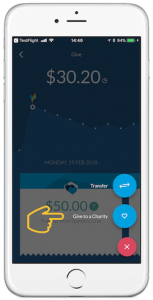 This helps make it easier for families to make donations via the app! This Giving Tuesday, why not make a donation to a charity of your choice directly from the Give pot, and help make this year’s the best yet? A Bake Sale is a great way to raise money for a good cause. Not only is it fun for the kids, but it’s also a good opportunity to hone your children’s budgeting and entrepreneurship skills. Have them list out what ingredients need to be bought for your baked good of choice. Then have them calculate the cost of the ingredients required. Get them to work out how many items they’ll be able to sell (e.g. slices of cake or number of cookies). Help them work out the price they have to set to breakeven on the ingredient costs (e.g. if the ingredients cost $10 and it will bake 20 items, the break even price is $0.50). Then help them set a mark up on the price which is the extra profit that will go to the charity. The secret is choosing to bake something that has a high yield of items to sell. Maybe it’s mowing the lawn for the neighbours or tidying up the garage that was meant to get done at Spring, your children can offer to provide helpful services in exchange for money! Not only are they raising funds for a good cause, but they can get a great sense of satisfaction for the effort they’ve put in to earn it. Once they’ve completed the task, you can Boost their RoosterMoney with the money they’ve earned. Or if you have RoosterPLUS, you can add these tasks to their Extra Jobs list. When the money is in the ‘bank’ they can transfer the money to their Give pot and make a donation request! If you’re getting involved in Giving Tuesday on Tuesday November 27th, don’t forget to share your efforts with us on social media with the hashtag #givingtuesday!